G.O.D. East African cooperative, Rueben Ndwiga, of Kenya, plants crops at the bio-intensive growing workshop. While Rueben has been a farmer his entire life, the methods and techniques introduced to him at this conference enhanced his ability to produce nutritious food for his family. The participants of our organization who are committed to serving in East Africa recently pooled their resources to sponsor four of our Kenyan and Ugandan cooperatives to attend a seven-day Bio Intensive Agriculture training program at the Manor House Agricultural Center in Kitale, Kenya. This training center was started by John Jeavons, a man internationally known as the leading researcher and developer for the small-scale, sustainable agricultural method known as GROW BIOINTENSIVE mini-farming. The central principle behind this method is to produce the maximum yield from the smallest unit of land, all without the use of expensive machinery and chemicals. Jeavons' food-raising methods are being used in 141 countries and by such organizations as UNICEF, Save the Children, and the Peace Corps. More than any other, John Jeavons has informed our approach to sustainable agriculture here at the G.O.D. International. Amidst all of the other voices in the realm of organic agriculture, we have found Jeavons to be the most globally minded. He proposes growing methods that empower the poor by utilizing the free materials they have access to on their own small plots of land, rather than being pressured to purchase expensive chemical pesticides and fertilizers. Not only do these wreak havoc on the health of farmers’ bodies, but also on the long-term health and fertility of their soil. BIA is an approach that focuses on working with the systems God has set in place within the created order, rather than fighting against them like we observe in large-scale industrialized agriculture. The Lord created the earth in a way that mankind would live therein and enjoy life. One of the greatest responsibilities mankind has been given is to take care of the ground, with the expectation that it would produce food. Plants, animals, and human beings were all created to work in conjunction with one another, with the goal of each part thriving in their own element. When we isolate these components to focus on large scale production, we break apart the system by which the created order thrives. Learning about these systems allows for proper land management that can allow the small farmer to feed his family, and potentially his community. Producing enough food has always been a challenging task for individuals, families, communities, and even nations in Africa. "We have our own compost stuck, prepared a double dig bed and even planted our kales. It is a wonderful adventure to be here at Manor House. We have also sent our double digging snaps, some of us preparing materials for compost among other things." This is why the ministry of Global Outreach Developments International has been thinking and researching ways of helping people (including those of us in East Africa) learn how to take care of their farms and ensure they are getting the maximum production of food possible. For over a decade now, the organization has been visiting East Africa with the burden of wanting to see the poor place food on their tables. 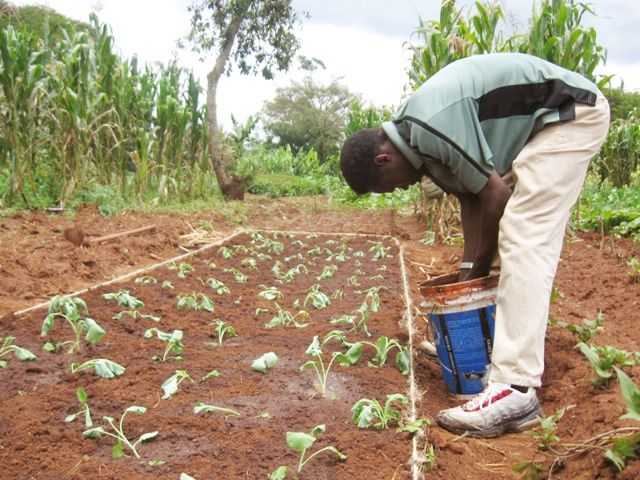 The great need for education amongst African farmers led to a team of us farmers being sponsored from both Kenya and Uganda to receive training in Bio-Intensive Agriculture at an agriculture center called “Manor House Agricultural Center” in the outskirts of Kitale, Kenya. The team was comprised of myself (Erastus Kanjogo), Rueben Ndwiga (from Kenya) and Peter Kimbugwe and Francis Lubega (from Uganda). While at the Manor House Agricultural Centre, we were able to learn so much more about this new and sustainable system of farming known as BioIntensive Agriculture. Due to lack of opportunities to further education surrounding agriculture, our farms have remained unproductive. People have only been doing what they found past generations doing [which had little emphasis on building and maintaining soil fertility, often leading to exhausting the ground of its nutrients.] Through the support of G.O.D. International, we have come to know that Bio-intensive agriculture is a system of farming which re-connects people with the created order (sun, moon, rain, soil, insects and plants). Unlike the systems of farming that we were used to, BIA has much to offer farmers, especially those (like us) doing small scale farming. BIA is a system that all farmers can embrace in order to ensure better crop production. Rueben Ndwiga, of Kenya, Francis Lubega and Peter Kimbugwe, of Uganda, enjoy a freshly made smoothie after receiving a lesson on how to store and preserve food in times of scarcity. The main idea of BIA is to improve soil fertility for better crop production. This is needful because soils have been depleted as a result of wrong farming systems. This has brought about malnutrition, poverty, hunger, and environmental destruction. However, proper farming systems will result in sustained soil fertility, which will create employment, help increase income per capita and help in conserving the environment. [BIA focuses on building up top soil and giving back that which has been taken in regard to energy]. This activity protects against soil erosion, reduces pest problems, and increases the nutritive value of the produce grown). It also helps to improve and maintain soil texture, structure, and water holding capacity of the soil. We have been enlightened by the concepts of BIA which are deep land preparation (double digging), composting (soil management), close spacing, crop diversity, companion planting, natural pest control (IPM), and open pollinated crops, all full of advantages for our situation. In times past, I have worried, fretting whether or not my crops will produce. After training with BIA, I am hopeful about my future. However, the one week training we have received has totally transformed our minds. Our families and respective communities will now benefit and celebrate the freedom contained in bio-intensive agriculture. Our soils are bound to heal and produce enough for our families and also communities. We had an opportunity to behold the truth and reality of BIA at MHAC. I believe that, with the help of the Lord, coming generations will be healthy and happy as our people apply this newfound system. Many thanks indeed to the entire community of Global Outreach Developments International for your love to see lives changed in Africa. This kind of empowerment has the potential to change not our communities, but even our nation.